After turkey and football we were relaxing reading our Dog Fancy magazine when we realized the National Dog Show was on the big box. What caught our eye was the hairdo on one of those kids. Momma thats '80's hair. Glad my hair can't get puffy. Look at this fella. Don't you want to pinch those cheeks? Now for the real show...ahhh yea...Mom is that Benny? Bennys in the box! Oh look at that wiggle....want some fries with that shake? 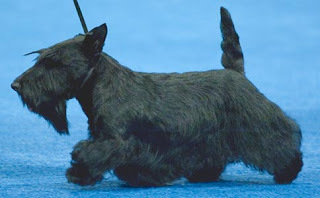 BOL..
Yep...Sadie the Scottie. We think we hear Jazzie screaming over here. OMG, mom was all squealy and thought Benny was in the big box too!!!! She cheered when he came in second, but was happy to see that funny bulldog win the group too. The Pug was ROBBED! We think that judge needs to make an eye dr. appointment toute de suite!!! SCOTTIE? WTF? That's the kleenex dog! (we're doing the "wave off" right now). Show is RIGGED I tell you!!! They're prejudiced against us smooshy face dogs!!!! Hope you had a great Turkey Day other than that! Hi, That was so cute! Very funny! Jazzi must have been thrilled. I was wondering who won! I was busy in the kitchen getting ready for company!! you have an huge big box!!!!!! and you saw the show on it!!! What a great great day you had!!! !We're sure you would be the winner if you will have participe in it!!! Tons of love and kisses!!!!!! Since it was Thanksgiving we didn't disappoint and stuffed ourselves silly. Hope yours was as delicious as ours! The Frenchie should have had it! What a cutie! She was robbed! We watched it too! We were rooting for the Doberman, though (I think she's #2 dog in the country! ), sorry! Sweet! We didn't see the show, so thanks for the great pix of YOU watchning and a bit of commentary. What a fun time! Do you guys like to watch TV too? I really like it when I hear cat sounds coming from it. we loved seeing you guys watch the dog show--hehehe!! mom says your blog never loads right on her computer and locks it up--boohoo!!! i think it is all the nice backgrounds take too long to load--so she sneaks peaks on other computers--she has to get a new computer!! We had it on BUT knew it was 'rigged' when neither the Sibe or the Malamute made the khut in The Working Group! Since I'm khloser to VA, I heard The Rokhky Khreek Skhotties pawtying all last night! OMD Terrible, I agree, it was RIGGED I tell ya! Hope your Turkey Day was great, ours sure was and we were thankful for all our Dog Blog Buddies! We missed the dog show! Bummer! We were too busy begging for pumpkin pie! We hope your Thanksgiving was the bestest ever! I saw the last half of the dog show because mom and dad were busy cooking and forgot to turn the tv on for me! B, buddy an' L, honey......I'm glad YOU all got tuh watch. Dad hogged the tube an' watched football.....which woulda been ok 'cept it wuz the LIONS! I mean, why bother? Oh, well. Thanks fer the commentary! That Sadie sure is a pretty girl. Gee, we're sorry we missed that. Mommy loves those shows! Hope you guys had a wonderful Thanksgiving! Usually pictures of the television do not show up so clear and pretty! Cute Benny and Lily! Friends on T.V. are the best! They don't steal your toys! Hi you two Frenchies- glad to see you have a blog too! When you get a break from watching dog shows (I watched too), please check out my blog: www.boccibeefs.blogspot.com. Feel free to comment and become a "Follower". I'd love to have you visit regularly - we can get to know one another that way! We wanted to watch it but my mom "had" to work! I can see you enjoyed it! We totally missed the big show. Grrrrr. Thanks for showing the highlights. We watched that show too...Wasn't pawsome! If momma let our hair grow long enough we would look like that one poodle....but at the end of the day we are country poodles.